Hundreds of people packed the quiet side street in central Mumbai (Bombay) to pay tribute to anti-terrorism chief Hemant Karkare, who was killed in the attacks on India's financial capital. Mr Karkare's body had been laid in front of his residence for people to pay their respects before his funeral on Saturday. The head of the city's Anti-Terrorist Squad (ATS) was one of several top officers who lost their lives in the attacks which began on 26 November. As civilians, politicians and police personnel of all ranks came to pay tribute to one of the most popular members of the force, the mood was solemn. His family were visibly upset as they watched people line up to offer flowers. Many of them watched his body being taken out for the funeral procession with tearful eyes before following behind. He was cremated with full state honours. 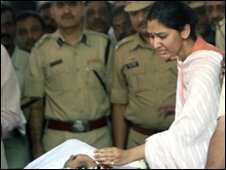 "Karkare sir had a unique way of working. He was always in the forefront as well as quiet, cheerful and inspiring," one police officer said. "That is exactly what he did on that night when he went in to tackle the terrorists." Of the 26 policemen who were injured on that night, 14 of them succumbed to mostly bullet injuries. Officers like Ashok Kamte and inspector Vijay Salaskar also lost their lives as unidentified gunmen openly fired at civilians and policemen. Bangalore is also mourning the loss of a leading commando - National Security Guard (NSG) Major Sandeep Unnikrishnan - who was killed during operations to flush out gunmen from the Taj Mahal Palace hotel. Police say they believe Mumbai has never lost so many officers in its history. 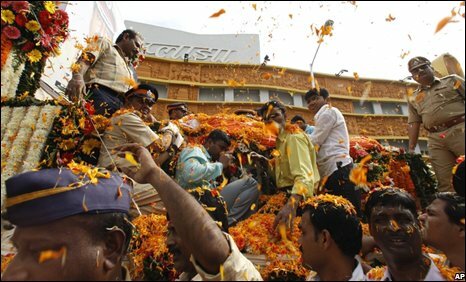 The city's force of about 40,000 police has dealt with events like the 1992-93 riots and serial bombings in 1993 and 2006 which caused even greater loss of life. Mumbai has also witnessed organised crime for several decades with scores of gangsters being shot in so-called encounters with police or in gang wars. "This casualty is far worse than encounters of organised gangs. Suspected terrorists were shooting without any thought," Deputy Commissioner of Police Amar Jadhav said. "As soon as Karkare sir heard that terrorists were opening fire he went in. He wore a bullet-proof jacket before going in but the bullets got him anyway." It has been difficult to reconstruct the sequence of events which led to Mr Karkare's death. The gunmen had hijacked a police van in southern Mumbai, which they later discarded. It was at the junction near the multiplex that the militants opened fire at civilians and the media. Later they were intercepted at Chowpatty, the famous beach by Marine Drive. One of the two attackers was killed by police and the other was arrested. Many of Mumbai's police officers and constables have not taken a break or gone home since the attacks began on Wednesday night. Every so often you hear them discussing the deaths of their colleagues. The feeling is of pride, admiration and there is a palpable sense of loss. Just outside CST station, constables have been on duty for more than 50 hours. When asked about morale among the police after losing so many of their colleagues, one constable P Mhatre, said: "I have been standing here holding this 10kg gun for more than 36 hours now. "If I put my gun down there is a risk of someone firing from the other side. I cannot let that happen. That is exactly what all policemen think. We have to ensure law and order at any cost." Dattatray Deshmukh, another constable near Dadar, said officers like Mr Karkare go a long way in mentoring juniors and ensuring good morale. "When you see officers like Karkare and Kamte you are only inspired to work more," he said. "Karkare sir used to be patient with every one and teach all of us. We have lost a great officer and we will continue to work."